I've wanted to play around with Steem Engine for a while and decided to finally take the plunge. I have no interest at this point in creating a token so I've just been doing some digging and finding tokens that I'd like to buy, so lets get right to it. If you want to start buying some tokens on the platform you need to create a Steem account and then download keychain. Once you have that set-up you need to deposit some liquid Steem assuming you have some. To do this go to the Market Page and look in the top right corner where it has a button to deposit Steem. Currently there is a 1% fee for depositing and withdrawing Steem that seems to be a little high. I'm hoping as the platform grows they either lower the fee down some or if you hold some Engine (ENG) tokens you can do so at a discounted price. 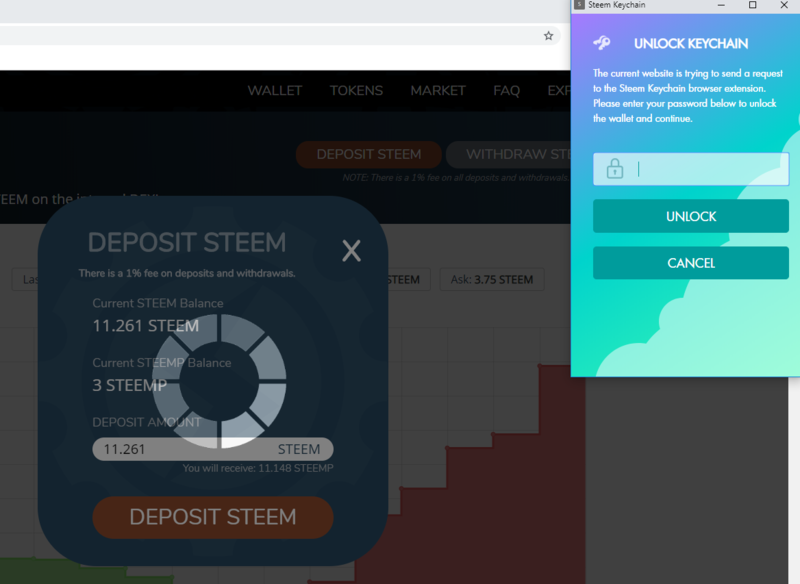 Once you decide how much Steem you want to send over you type in the deposit amount and confirm the transaction using the Steem Keychain. Within a matter of seconds to a few minutes at most you'll have your Steem tokens available to purchase Steem "Alt Tokens" or what I'm going to try and trademark Salt Tokens. Now onto searching for a Token. The best way I've found to search for them is go to the Tokens Page and then sort from highest 24h Vol to lowest. This allows you to find more information about the token by clicking on the blue i button, going to the market by clicking on the left and right arrows, and look at trade history by clicking on the "list" icon to the far right. I wish the history would include how much Steem you paid for the token when you bought it. It includes the date and how many you bought, but it doesn't include the price you paid. If it did it would be great for helping track historical purchases, but for now I'll stick with keeping a separate spreadsheet with this information. I love the idea of using the platform to buy Beta and Alpha packs. Beta isn't as exciting as the ability to buy Alpha packs since they are no longer for sale on the SteemMonsters site. I plan to pick up cheap Beta packs when I can and as long as the Alpha packs aren't outrageously expensive picking up one or so a week of that as well. 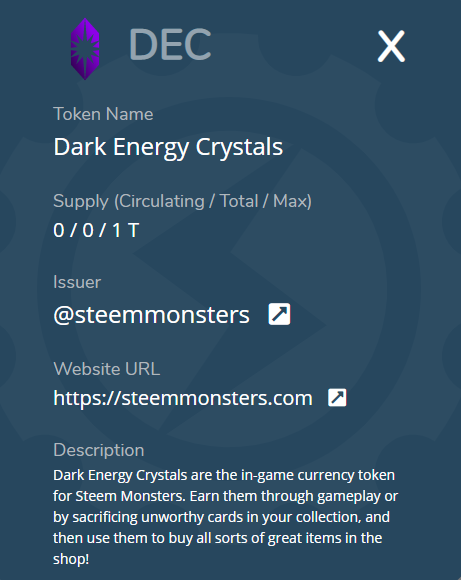 The Dark Energy Crystal Token is an upcoming token that will be released soon and I'm looking forward to it. I don't know what exactly you'll get to buy with it, but unless it's something dumb like a SteemMonster pin (which I doubt because everything else that has been released by the SteemMonsters team has been awesome) I see the Crystals holding their value well. @abh12345 does a lot of great work for Steemit coming up with charts, charts, and then turns his charts into contests. He provides a lot of value to the platform for free and has recently created a token to start making a small amount of profit for all the charts he makes. I won 300 Engage from his Engagement League, but plan on buying some small amounts over the next few months/years and hodl just as a way to support him. 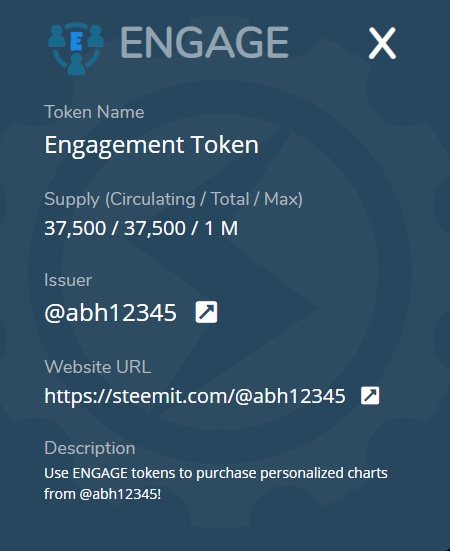 Hopefully, during the next bull run I can help out some newbies as well by sending him some Engage for people on the platform that would like one of his charts, but can't afford Engage Tokens to get one. @abh12345 is a good guy and would probably just give them the chart for free, but this way he doesn't have to! I don't mean this as an insult to Drama Token, but to me this is the Dogecoin of Steem Tokens. The reason I say this is it's just a fun little Token to play around with and teach others how to use Steem Engine and Keychain. To my understanding if you own at least 10 Drama you'll be able to give out some drama everyday (up to 40 Drama total). I could be lying or mistaken so be sure to check out the announcement for Drama here. I hope @whatsup keeps updating this token and improving upon it as it seems like a great token so far. I have some low bids in to get my Token count up to 10 so I can start giving away a few tokens every once in a while when I'm see some really good Drama. 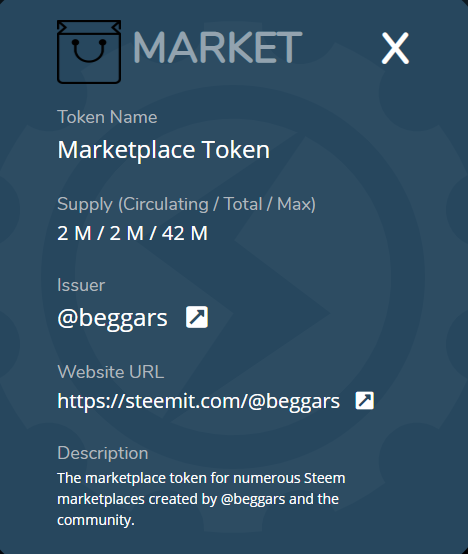 On that I just stumbled across this morning was the Market Token created by @beggars. He currently has a giveaway going on here for 10 Market which will be worth roughly 5 Steem to the first 30 commentors and so far only 3 people have commented that weren't bots. Call me crazy, but head on over there read the article and leave a quality comment to help support this great project. The first development update post has already been released along with a roadmap. This could be a great way to take some profits during the next bull run using these tokens to buy gift cards which is the first plan for the site with more options to come in the future. One reason Market Tokens are required for purchase is to help pay for maintaining the site and infrastructure that will be used to sell the gift cards. The SUFB Token is being used in the Crypto Class Action Vs Facebook and Google. According to the creator of the token. The SUFB tokens collectively have a contractual right to 25% of the damages of signed up class members in the Class Action against Facebook & Google's Crypto Ad Ban. You can sign up for the class action here. I went ahead and signed up and am awaiting for some tokens to be sent my way. I'm still on the fence about actually buying more tokens as this could be one wild ride. I'm anticipating as good news comes out these tokens will swing hi and then when bad news comes out there will be huge sell offs. As of now this is a little to high on the risk side for me to purchase at current prices, but something I am keeping an eye on. I think now would be a good time to start accumulating Freex tokens, but this is also a huge risk to me as well. 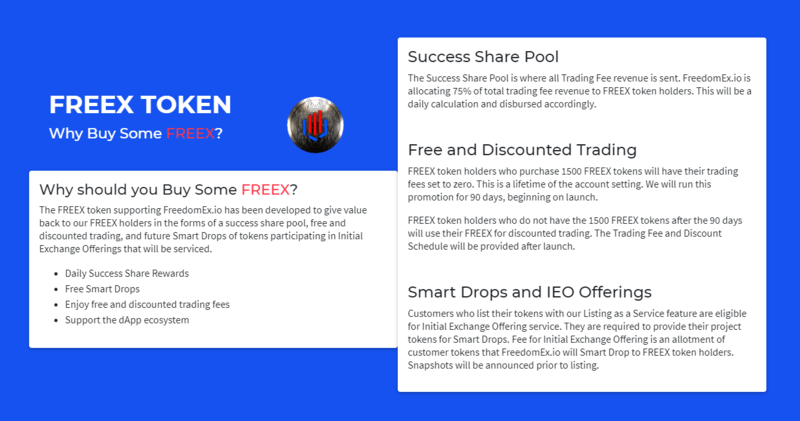 They have a lot of good rewards which include discounted traded fees, free air drop tokens, and a share of the exchange profits. In order for this to work out though, people will actually have to use the platform and am curious if Steem Engine plans on competing when SMTs are released or if this will take the place of Steem Engine. This will be a great buy if this exchange becomes a popular place to buy, sell, and trade SMTs. If this exchange doesn't gain any traction once SMTs are released it will be a complete waste of money as the rewards I expect will be very minimal and most people won't want to list an SMT on a dead exchange. Have you spent much time browsing around tokens/projects on SteemEngine. If so what's your favorite Token on there and let me know why + a little about the token.